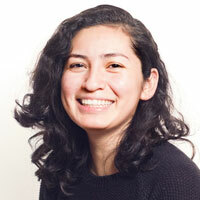 Editor’s note: During each Chips Quinn orientation and multimedia training in Nashville, Tenn., scholars are required to complete a mobile media reporting module, which includes producing videos and reporting and writing stories. Their work is displayed here. 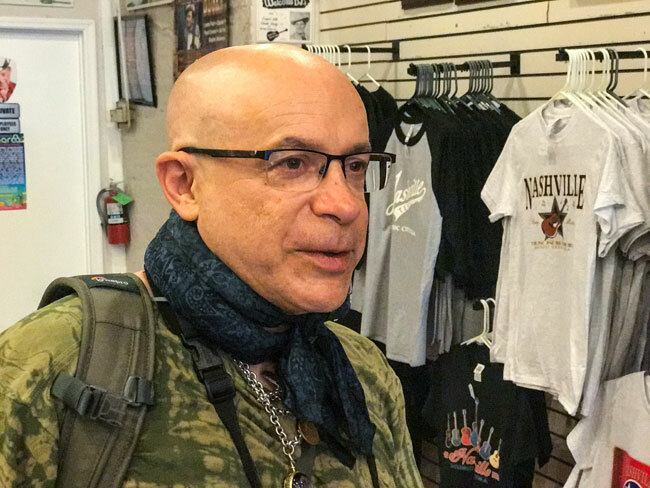 NASHVILLE, Tenn.—Andy Tucker was 11 when he first stepped into the Ernest Tubb Record Shop. He had read and heard about the shop and the famous artists who had performed there, and couldn’t help but feel overwhelmed. “I was really in awe,” he recalled. His first purchase was a book about country artist Porter Wagoner’s life, “A Satisfied Mind: The Country Music Life of Porter Wagoner,” by Steve Eng. The sounds of music legends Tubb and Roy Acuff drew him to the store, but a combination of a phone call, timing and opportunity brought him back almost three decades later. Tucker, 40, manages the historical record shop at 417 Broadway, which sells everything from vinyl to air fresheners in the shape of guitars. “I took [the job] ’cause I loved this place,” said the Alabama native, who has managed the store since May 2016. Stepping into the shop from the bustling streets of downtown Nashville, customers become immersed in a different era, Tucker said. A grinning statue of Tubb, holding a guitar with the word “THANKS” written across it, stands near the entrance. Framed photos of country music artists line the wall, some with scrawled autographs. A signed poster of Loretta Lynn hangs above rows of CDs, swaying slightly in the breeze from the churning ceiling fans, as country music plays in the background. Toward the back, cardboard cutouts of more artists line a small stage. Occasionally, performers will climb the stage and put on a show, but the shop’s Ernest Tubb Midnite Jamboree takes place off-site at the Texas Troubadour Theatre on Saturday nights. It’s the history that makes the record store unique. It opened in 1947, after Tubb found that fans were having a hard time finding his music and the music of other country stars, Tucker said. 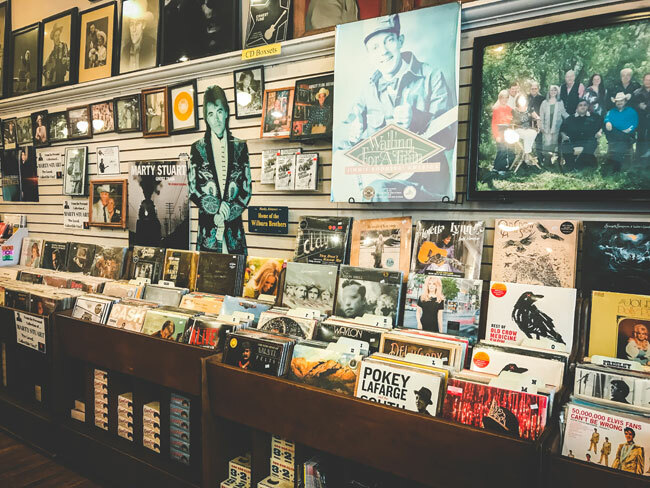 Today, in an era where digital music is thriving, the record shop is hanging on and adapting. “We stock a lot of things people can’t find,” he said. On any given day, there’s no telling who might walk through the doors of the store. In early June of 2016, he said, Ringo Starr stopped in on his way to the airport. 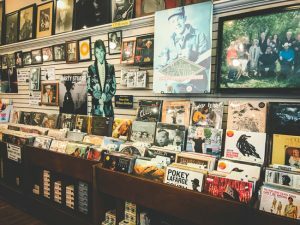 “It’s just a testament to the record shop,” said Tucker, who added that contemporary artists like Kacey Musgraves have visited as well. Assistant Manager Earlene Huff has seen customers walk into the store and become emotional. Huff, who has worked at the shop for more than 46 years, recalled meeting Tubb and how he would enter the store and greet people as if he had known them for years. Her favorite part of her job, she said, is talking to customers. One man had tears in his eyes at the thought of the artists who have played at and patronized the shop, she said. “The store touches people in different ways,” Huff said. For Tucker, the shop is second in country music stature only to the Grand Ole Opry in Nashville. But he admitted he’s biased; he’s proud to work at the record shop. “There’s one of these in the world, and I get to manage it,” he said.